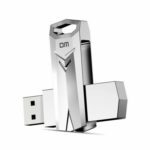 DT100 G3 USB Flash drive is compliant with USB 3.0 specifications to take advantage of technology in newer notebooks, desktop PCs and digital devices. 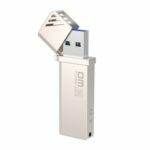 DT100 G3 makes it easier than ever to store and transfer documents, presentations, music, video and more. 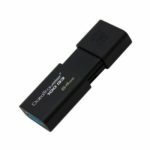 High speed USB 3.0 interface can transfer files in seconds, and backwards compatible with USB 2.0/1.0. 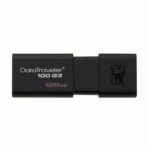 Store your entire digital world on Kingston’s DataTraveler 100G3. 64GB capacity makes it easy to take your photos, videos, music and files anywhere you go. DT100G3 pen drive boasts a reading speed of up to 100MB/s and writing speed of 10MB/s. Capless design protects your important content when not in use. Just push and pull for opening and closing, no need to worry about losing the cap. For your peace of mind, Kingston DT 100G3 is backed by a five-year warranty, free technical support and legendary Kingston reliability. Widely compatible with Windows 10/8.1/8/7.1 (SP1); Mac OS v. 10.12.x & above, Mac OS v. 10.10.x & above; Linux v. 2.6.x & above, Chrome OS, etc. 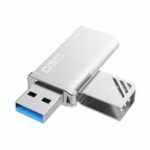 DT100G3 features a sleek, cost-effective design to make adding to the USB 3.0 experience a minimal investment. It is compact in size and light in weight, designed with hanging hole, easily attaches to keychain, convenient to carry around.